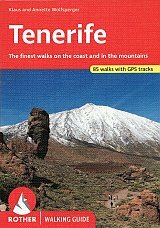 Tenerife is an ideal island for hiking with the sea in sight at all times. The range of the 80 hiking tours in this guide includes easy paths over rough cliffs as well as ascents to peaks that offer fabulous views. Hiking paths through primeval forests are also included, such as the partially paved Caminos, which in the early days were the main connecting routes between villages. Many tour suggestions are suitable for less experienced hikers and there are also more adventurous cliff tours, spectacular ravine excursions and extensive mountain trips. 264 pages, 192 photos, 73 height profiles, 70 maps in 1:50,000 / 1:75,000, 4 overview maps in 1:400,000, GPS data avialble.